Should You Give Your Baby Prune Juice For Constipation? Prune juice for constipation works extremely well at easing baby’s discomfort. Just like adults, babies often face abdominal discomfort and constipation. Babies commonly become constipated when transitioning from a full liquid diet to solid foods. However, the prune juice constipation treatment should provide relief then — and any other time your child gets constipated. What are the signs of constipation in babies? Why is prune juice a good constipation remedy? Prunes are a natural remedy for constipation (and, as a bonus, they’re rich in iron, potassium, and other key vitamins). Additionally, prune juice for constipation is extremely reliable and safer than using medications. Some parents find that prune juice is even more effective than psyllium-containing medication and without the risk of harmful side effects. How much prune juice should I give my baby? The amount of prune juice you give to your baby depends on her age. For babies under 6 months, dilute 1 tablespoon of prune juice in 2 to 3 ounces of water. 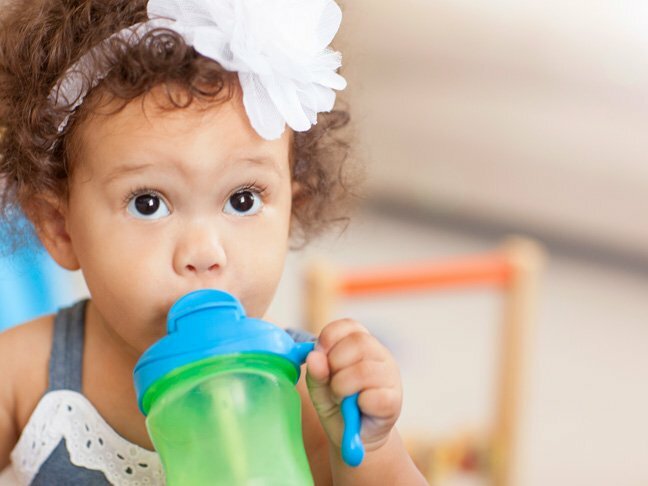 You may want to begin with 3 ounces and work down to 2, to help your baby get used to the taste of the juice. You can give babies up to 1 ounce of prune juice per day for every month of age; for example, a 1-month-old baby can have up to 1 ounce a day, a 2-month-old baby can have up to 2 ounces per day, and so on. Once your baby reaches 6 months of age, you can give him or her prune juice in a bottle without any dilution. Begin giving them 2 ounces at a time without adding any water. If they have no issues with tolerance, you can give them up to 8 ounces at a time. It is very important to make sure your baby keeps a normal food and formula schedule. Prune juice should only be used as a supplement to their meals and not as a replacement. How long does prune juice constipation treatment take? For most babies, it can take several hours after consuming the drink for them to produce a bowel movement. Some babies have had success within minutes. The time it takes to work varies greatly from baby to baby but should take no longer than 12 to 24 hours. If your baby is struggling to go, prune juice is a safe and effective way to get their bowels moving and eliminate discomfort. It is always a good idea to consult with a doctor if you do not see prune juice for constipation working within 24 hours. How to Cope When You Feel Judged By OthersWhat Causes Baby Hiccups? Get the latest from the Momtastic team! Got a question or a comment? Tweet us at @itsmomtastic, find us on the Momtastic Facebook page. Pin with us on Pinterest, too!